Two members of Nogizaka46's idol group, Sayuri Inoue, and Mizuki Yamashita became cover girls for the latest edition of Japanese manga magazine Weekly Shonen. 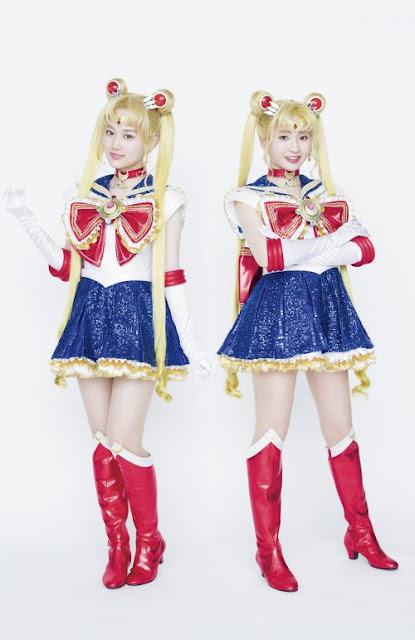 In these popular magazines, these two beautiful girls perform special photo shoots by dressing up the iconic Sailor Moon anime characters around the world, they wear exactly the same costumes worn in the stage drama titled Nogizaka46 Version Musical Sailormoon. For the cover of this magazine, Sayuri Inoue and Mizuki Yamashita pose with a set of very adorable striped pajamas. They were also interviewed about the various things about Sailor Moon, the preparation of the stage play they were going to play, and other fun questions like who their idol group Nogizaka46 most often used LINE apps. The stage drama Nogizaka46 Version Musical Sailormoon itself consists of two core teams separated into Team Moon and Team Star. Team Moon consists of Mizuki Yamashita, Riria Ito, Kazumi Takayama, Ami Nojo and Hina Higuchi. While Team Star is filled by other members like Sayuri Inoue, Miria Watanabe, Ranze Terada, Minami Umezawa, and Kana Nakada. Every day these two teams will take turns, and of course, Sayuri Inoue and Mizuki Yamashita will play as Usagi Tsukino's figure much loved by many fans of the series. Nogizaka46 Version Musical Sailormoon will be staged at The Galaxy Theater, Tokyo on the 8th to 24th of June and at TBS Akasaka ACT Theater on September 21st to 30th. As for Weekly Shonen magazine special edition, Inoue and Yamashita have also been released in Japan, since June 6 yesterday.